Primary research question: Can Med-O-Wheel improve adherence to the prescribed medication regimen in renal transplant patients? Post Renal Transplant Patients: Kidney Transplant, Medication Adherence, Compliance, Medication Non-Adherence, Transplant Failure, Kidney, Electronic Medication Dispenser, EMD, Renal Transplant. Official Title:	Compliance/Adherence After Kidney Transplant, With or With Out an Electronic Drug Dispenser(Med-O-Wheel™), Karolinska University Hospital. All kidney transplant patients at Karolinska University Hospital, Huddinge , Sweden will be given information about the study and will then be asked to participate. Participants will be randomized into two arms, one arm with and one with out Med-O-Wheel (Electronic Medication Dispenser Pill Box). The 80 included patients will be closely monitored for 1 year regarding intake of prescribed medications. Study design: Open, prospective, descriptive, randomized study. Primary research question: Can Med-O-Wheel EMD (Electronic Medication Dispenser) improve adherence to the prescribed medication regimen in renal transplant patients? Efficacy parameters: P-Creatinine, concentrations of medication (B-tacrolimus, B-cyclosporine, B-sirolimus, P/S-mycophenolate, B-TPMT-metabolites) and age(years). Study-specific questionnaire to survey patient discomfort relating to compliance and adherence. Volunteer population. 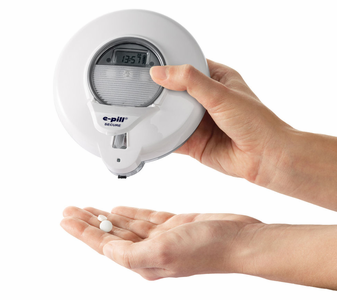 Copyright © e-pill Medication Reminders 1997-2018, 2019 e-pill®, CADEX®, HIProtector®, ePill®, PuffMinder®, Accutab®, FreshAlarm®, MedSmart®, MedTime®, Medical Snooze™, patient compliance dashboard™ and e-pill pager medical reminder™ are trade and service marks of e-pill, LLC. All Rights Reserved.